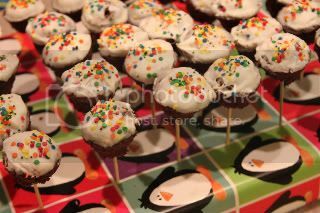 Kara's Creative Place: Brownie Pops... the frustrating way. I had to post these under the catagory Food Fun because they are fun food, but... They were not FUN to make. Here is the story. I needed to bring a snack to my daughters school because she was "Star of the Week" for her class. I know I wanted to make something special but didn't have time to plan exactly what that week. I found myself at home the afternoon of the day before trying to come up with something. 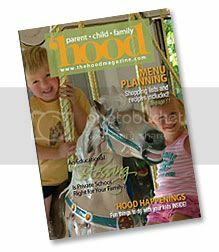 I had a brownie mix, but didn't want to make boring brownies, plus whatever I brought when I came to read to her class in the afternoon she would have to haul home with her so a brownie pan was not a good idea. Then I remembered brownie pops. 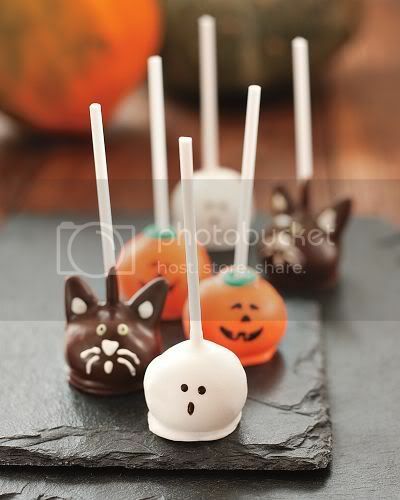 These gorgeous little brownie bites on sucker sticks that can be decorated so beautifully. Are they not gorgeous?? They are not mine, this is a photo from Fresh Pink Style's blog. So I looked through the cabinet and took stock of what I had. I didn't want to run to the store that night. Sucker sticks... (who has sucker sticks?? )Think outside the box Kara... Aha! 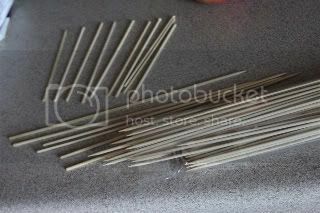 Bamboo skewers cut in half. Check. Sure they are not quite as large, what difference will that make???? First people say to cook brownies in a pan, freeze them, cut them into bites, stick the stick in them, Then freeze them again. Then dip and decorate. I had also seen those nice little silicon brownie pop pans that pop out perfect little brownie bite shapes like this one. "Well" I thought to myself. "That must save time but I don't have one, but a mini muffin tin is close enough to that size so I will use that." Drawback.. I only have one pan, it makes 12 mini muffins. I would have to do three batches and bake them one at a time. Not a problem or so I thought. I was confident in my plan. 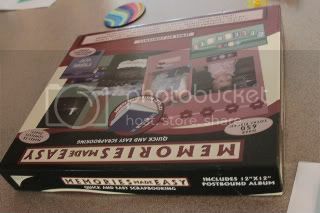 I pictured me taking out the pan and turning it to see precious little brownie bites popping out of the pan onto the counter below. But... even though I sprayed the mini muffin tin generously those precious little brownie bites would not budge. Frustration began to set in. I had to dig each one out of the pan using a butter knife. This took forever by the way. 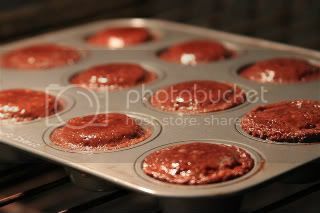 Then I got to wash the thick brownie residue off the mini muffin tin and begin all over again. Not just once but two more times so that I would have enough for the class of 25, plus two teachers, because of course I know teachers like snacks too. So I took the first group down to the freezer. I realized I wanted to try the double boiler method for dipping the brownie pops, instead of a cup in the microwave. This way I would be able to keep it warm instead of having to pop the almond bark in the microwave all the time to keep it from hardening. Yet I found I had to use a lot of almond bark to get it deep enough in the pan in order to dip the whole brownie pop. I wanted to go all the way to the stick. I took the first batch of bites out of the freezer 20 minutes was surely enough time for them to freeze. Who were these people suggesting hours of freeze time. They must be crazy. I didn't have that amount of time, it was already after dinner before I began this project. Then I started putting my sticks into the brownie bites. I tried to dip a few. Well... they didn't stay on the stick. If I did try to dip the whole thing it would fall off the stick into the almond bark obis. Trying to fish it out with the stick also met with disaster. The brownie was a bit crumbly and parts would fall into the batter. I finally dipped one successfully only to find it dripping an almond bark ocean onto the waxed paper I set it on. I had it pictured that I would dip them and put them directly into the holder I created. Wrapped the top, yep we only have holiday paper in the house this was the most neutral I could find. and used this sharp object to poke holes in it to hold the sticks. I did try that. 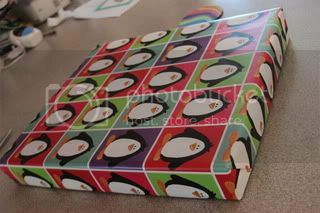 I ended up with almond bark all over the decorated box. Bad idea! Bad! So I decided to hold the brownie bite in my hand and only dip the top. Then put it on the stick. Nope, no good either. 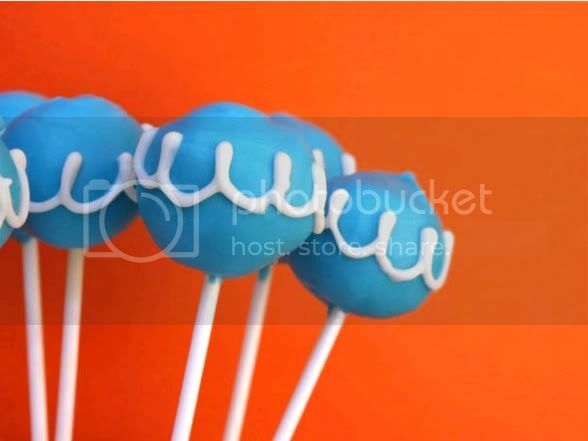 The standing stick would poke though the top of the brownie pop. 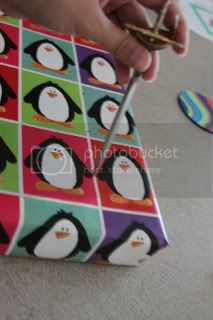 So the bite was down at the bottom of the stick sitting on the pretty penguin paper. UGH!!!! 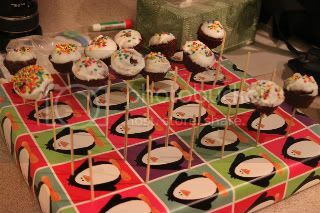 This was not fun, and I had already spent more than an hour and a half working on these Precious little Brownie POPS!!! Couldn't stop now, had to make them work. I wasn't running to the store to buy treats for her class and I am not going to toss this stuff... Had to make it work. Take the brownie bite. I even skipped all freezing at this point. GRRR.. I held onto the bottom. Dipped only the top and set it on it's bottom onto waxed paper. I Put sprinkles onto the top while almond bark is still wet. Then waited until the almond bark is COMPLETELY set. It has to be totally hard otherwise the weight of the brownie pop made the stick pop thought the top of the pop. 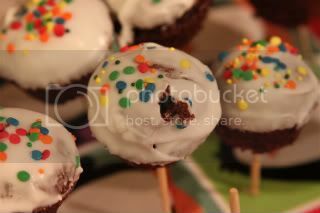 See hole in brownie pop? This is after I fixed it of course. Put all the sticks into the box first!!! Wiggling these things around trying to get them into the holes is not a good idea. You want the sticks to be snug so that they are not bobbing around while you move them, in my case anyway, so I had to put the sticks in first. Then put your hardened pops onto the sticks. The almond bark shell keeps the stick from poking though. They stayed and worked. They turned out cute but I must say they took about 3 or so hours start to finish and lots of frustration, and revamping. I did not enjoy this project. 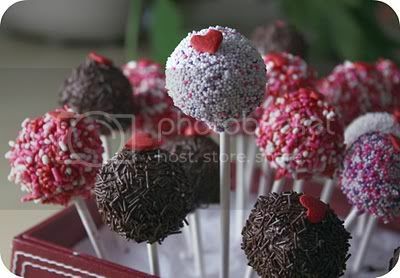 I do not recommend it, and If you think these beautiful little brownie pops you see in stores are not worth the money. You my friend would be wrong. Those people should be paid millions to make these things. I figured I could do it! And... I am sure I could do an awesome job if I had the right pan, the right brownie consistancy, the right dipping chocolate a nice double boiler, some real sucker sticks, Jupeiter lined up with Mars, and was had a whole day to waste. But none of that is going to happen anytime soon so I am putting this project in my FLOP catagory. I've met my match. I'm a new blog follower from Home with the Boys. All I gotta say is "OH NO!". That is such a bummer that it didn't work out. Next time I think I could make something like this, I will rethink it. And just buy them all ready made. Thanks for the heads up. 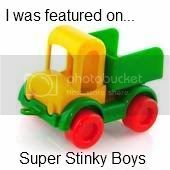 I just found your blog from MADE and I think this post is hilarious. In fact, I had the same exact thing happen to me. Only I was making Hello Kitty Cake pops. Then I was stupid enough to try again. I've learned my lesson and I'm glad I'm not the only one! I don't remember how I found your blog, but I'm a long time reader and am constantly in awe of all you do. But, is it bad that I'm encouraged that there is FINALLY something you can't do?! I recently made brownie pops for the first time, and just wanted to add that if you change a few of your steps they'll be easier - I made them with twin whirling dervishes running around me! If you add one egg to the box mix and shave five minutes off the bake time, your brownies will come out fudgy. Let them cool enough to handle, and in the pan make a cut near the edges, like you're cutting the edges off. Mix the brownies with a spoon to get rid of the top - it should all look a little fudgy. You can do all of this in the pan. Once they are mixed, spray your hands with spray oil. Start "balling" the brownies into pop sized balls, and place on waxed paper on a cookie sheet. Throw them in the fridge for a few hours. 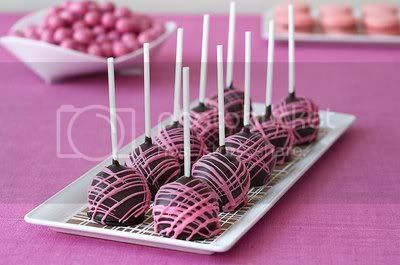 I microwaved melting candy until it was just runny when mixed, and dipped my lollipop sticks in candy then stuck them into the brownie balls. 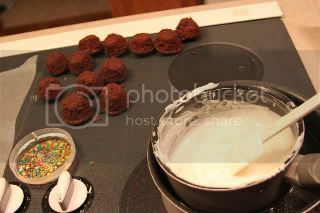 Once they hardened a bit I dipped the entire ball with a little of the stick into the candy coating. I dipped each one in sprinkles, put them back on waxed paper and stuck them back in the fridge. 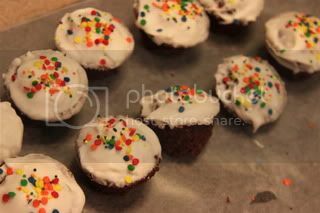 They had flat tops but who cares - they came out yummy and held together! I hope that helps, I totally understand how frustrating it is to make something that doesn't work. We all have flops sometimes!